· Donovan: vocals, acoustic guitar. · After the 1996 album Sutras it was reported that Donovan had completed a follow up album, titled The Promise. This was to be published by the same label, Rick Rubin's American Recordings, but the sales of Sutras didn't match the company expectations and Donovan's contract wasn't renewed - so The Promise, finished and ready for publication, never saw the light of day. Many of theses songs intended for The Promise were finally included on Ritual Groove as their original recording from around 1996. 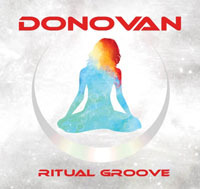 · In 2006, after Beat Café (released in 2004), Donovan's new album was announced on his website, for the first time, as a 2CD set called Ritual Groove. The release was scheduled for March/April 2007 and the Ritual Groove Tour was also announced to coincide with it: 13 concerts in April in the UK, including a date at London's Royal Albert Hall. Songs rumoured to be included were Buddah Baby, The Illusion and the John Lennon influenced Save The World. It was said that the entire recorded was financed by David Lynch and further rumour had it that the album was the soundtrack for a new Lynch film called The Square Root of 1%. Donovan claimed that the album was "a soundtrack to a movie not yet made. As a matter of fact, it is a movie soundtrack and at least five directors have expressed interest in doing scenes. So it's very much a new media platform project. I'm hoping David [Lynch] will pick one of the scenes". · Shortly after, the tour dates were canceled due to "poor ticket sales", according to the announcement on the official website. This note was changed few days later by another indicating "unforeseen circumstances". The album was recorded and finished but wasn't released. · In late 2007 the Peer Music promo-only sampler CD New Songs From An Icon, containing 11 tracks, appeared. Supposedly this was never intented for release, but it was available -according to some sources- accidentaly only in France for a short time, and spread soon on the Internet. The 11 tracks included were Gentle Heart, The Olive Tree, Jah Healer, Amore, Devil Weed, Open Up Your Heart, The Mountain, Big Pop Star, Local Boy Chops Wood, A Woman's Work and The Dignity Of Man. Many of these songs were recent recordings, perhaps for the aborted album The Promise, but others were recorded in the 70's. 7 of this tracks ended up on the Ritual Groove album. · In 2008 Donovan released the single Cherchez L'Erreur, a duet with French singer Zouzou, as a digital download on iTunes. This song would end up on the Ritual Groove album. · Nothing else was known about the album until two years later when in 2009 the Ritual Groove tour was announced again on his website. Fans could send their e-mail address to receive information about future tour dates - only the Monterey concert in May 2009 was scheduled as a "demo concert" or trial for the tour idea: perfumes were to be leaked out into the audience during the show as part of the music experience. Some of the audience complained of coughs and dry throats. · In April 2010 Donovan released a new single called I Am The Shaman on his own label Donovan Discs. The song was recorded in March, in David Lynch's music studio in Hollywood and Lynch himself produced it. It was the first song available from Ritual Groove, only on iTunes. · Until October 2010 Donovan played several concerts and festivals, sometimes including songs from Ritual Groove, like Refugee Of Love or The Promise. The Illusion was previously performed in January 2007 at the Kodak Theatre concert in Los Angeles. · On October 5th, Ritual Groove was presented on the official website as a double album with 27 songs, published by Donovan Discs. A 5000 copies deluxe limited edition with 36-page book was available as a pre-order, only through the official website, for 30€ (plus 10€ worldwide delivery). This pre-order would be sent out on October 18. This deluxe edition was also available at the Olympia Theatre concert in Dublin, October 6, reportedly the first concert of the Ritual Groove Tour. · On December 8th the second single from Ritual Groove was released: Save The World was presented as a John Lennon tribute (it was released on the 30th anniversary of Lennon's death). The song had a very "Lennonish" or "Beatlesque" style and sound. Donovan stated: «it is as if John wrote this song through me. I wondered what would John write about now. I picked up the guitar and this very 'John Lennon style' song came to me. It feels like John wrote it». All proceeds from the single went to the David Lynch Foundation. Donovan wrote it at least before 1999, as there's a video of Donovan performing Save The World in front of some Japanese fans in that year. The single was only available only on iTunes.